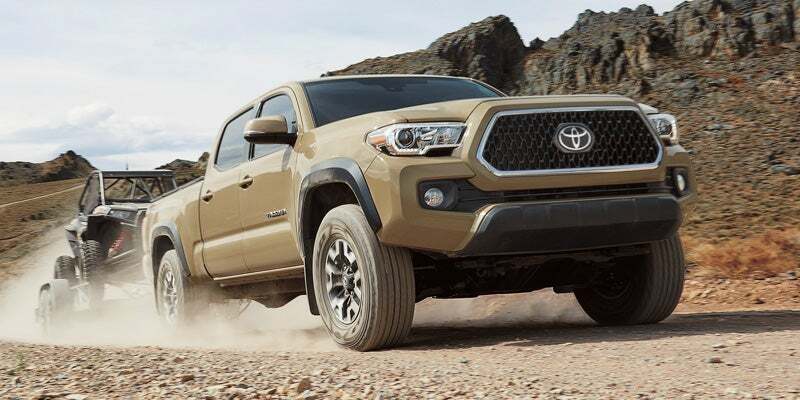 The 2019 Toyota Tacoma is a rugged and stylish truck with great road presence. The available four-wheel drive models have superb off-road capabilities that leave the competition in the dust. Whatever you need to haul, the Tacoma’s payload and towing capacity helps you to get the job done. Here are four great features of the Tacoma. Six trim levels are available: SR, SR5, TRD Sport, TRD Off-Road, Limited, and TRD Pro. You also have a choice of two engines, extended or crew cab, and a 5-foot or 6-foot bed. The base SR trim offers a distinctive gray grille, projector beam headlights, daytime running lights (DRL), body-color side mirrors and rear bumper, and 15-inch steel wheels. In the truck bed is a deck rail system with movable tie-down cleats. SR5 models add a chrome-accented charcoal grille, foglamps, alloy wheels, and a chrome rear bumper. The TRD Sport trim features LED DRL, a body-colored rear bumper, and 17-inch wheels. The TRD Off-Road has unique styling with 16-inch contrast alloy wheels, a chrome rear bumper, black over-fenders, and a 120-volt AC power outlet in the truck bed. The top-of-the-range Limited only comes with the crew cab and offers a bright grille, chrome door handles and mirror caps with integrated turn signals, chrome foglamp bezels, and 18-inch polished aluminum wheels. The AWD-crew-cab-only TRD Pro gets a unique grille, aluminum skid plates, black over-fenders, matte black hood scoop, all-terrain tires on 16-inch black wheels, and LED foglamps. The SR and SR5 feature a four-cylinder 2.7-liter engine delivering 159 horsepower and 180 pound-feet of torque to the rear or all four wheels. Available for these models and standard on the others is a powerful 278 horsepower 3.5-liter V-6 engine producing 265 pound-feet of torque. Both engines are paired with a six-speed automatic transmission, although TRD models have the option of a six-speed manual. When properly equipped, and depending on the configuration, the Tacoma has a payload of up to 1,440 pounds and can tow an impressive 6,800 pounds. Inside the SR you’ll find cloth upholstery, a multifunction steering wheel, chrome interior accents, and a sliding rear window. The SR5 adds keyless illuminated entry, a 4.2-inch multi-information display, and a leather steering wheel, while TRD Sport models offer premium cloth upholstery, push-button start, and a power-sliding rear window on the crew cab. Limited and TRD Pro trims feature leather-trimmed upholstery and dual-zone climate control. The SR is equipped with Toyota’s Entune infotainment system which includes a 6.1-inch touch screen with integrated rear-view camera, voice command, Bluetooth wireless technology, six-speaker sound system, and three USB ports. The SR5 gets a Wi-Fi hotspot, while the TRD Sport adds a 7-inch touch screen with integrated navigation, and an upgraded sound system. Limited and TRD Pro trims offer a seven-speaker premium sound system. Every Tacoma model has Toyota Safety Sense and an impressive array of other standard or available safety features. To see which Tacoma suits your work and lifestyle, head down to Marion Toyota for a closer look.